Egypt’s president Abdel Fattah al-Sisi met Wednesday for the third time in a year with Russian leader Vladimir Putin in Moscow. 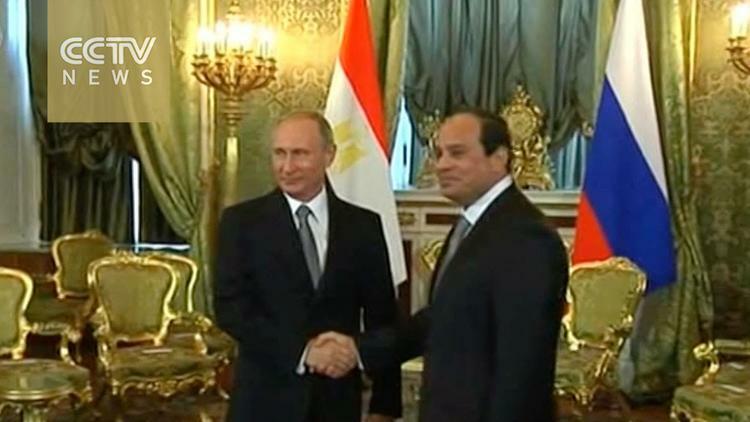 Putin is attempting to draw Egypt into a common front against terrorism. He wants to fight Daesh [ISIS, ISIL]) in Syria, which is only a 24 hour automobile drive from Russia’s troubled Chechen region. Putin sees the common front against Daesh as a basis for a new level of strategic ties between the Moscow and Cairo. But Putin put sl-Sisi in a difficult position by saying that the anti-terrorism front would include Syria’s president Bashar al-Assad. Al-Sisi carefully avoided saying anything in response. Egypt quietly has good relations with Syria, but its main backer right now is Saudi Arabia, which is attempting to overthrow al-Assad . The two have some common economic interests, as well. Russia is offering to build Egypt a nuclear power plant, and Egypt is offering Russia some free trade zones along the refurbished Suez Canal. Egyptian critics complained that al-Sisi dressed just like Putin, in a dark three piece suit, for all the meetings.